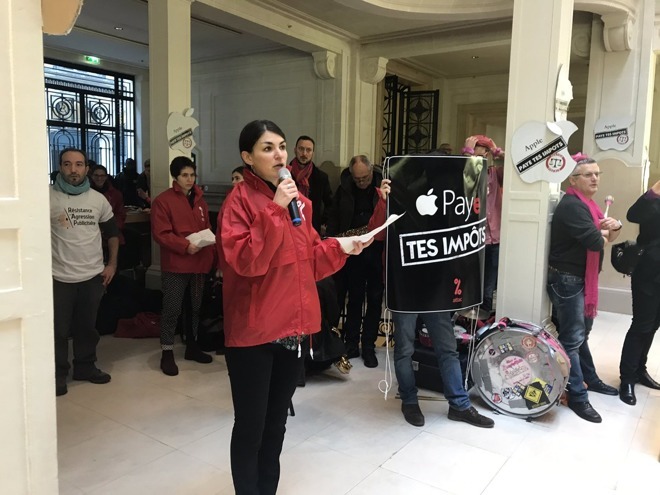 Around 100 people occupied Paris' Apple Opera in a centerpiece demonstration by the Association for the Taxation of Financial Transactions and Citizen's Action, or Attac for short, according to MarketWatch. There activists pushed past security staff and set up signs, including protest messages left on devices, and a banner with the slogan "We will stop when Apple pays." Some activists handcuffed themselves to railings and waited for police. The security team evacuated Apple workers from the building. The event lasted three hours, and Attac said it was planning to meet with an Apple representative later on. For years, loopholes in Irish tax law allowed Apple to funnel billions in international revenue through the country while paying a minute fraction in taxes —as little as 0.005 percent in 2014. Apple and the Irish government have denied any wrongdoing, but last year a European Commission investigation concluded that Ireland extended preferential state aid, something illegal under E.U. law. 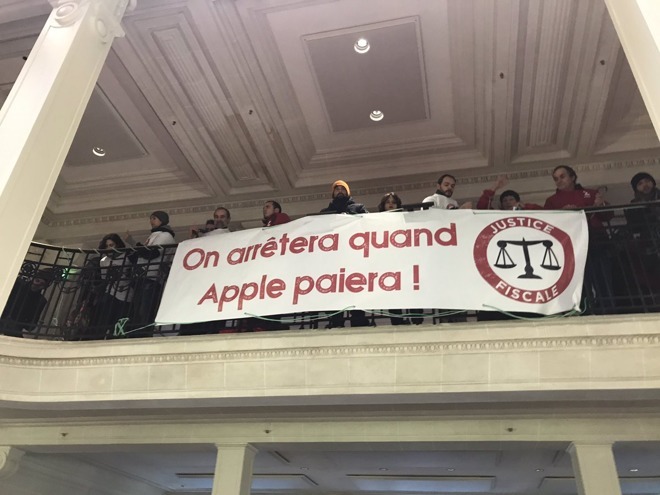 Appeals are currently in progress, but Attac demanded that Apple withdraw its appeal with the European Court of Justice. It also made separate criticisms, directing attention to labor practices by Apple suppliers, pollution caused the the extraction of metals, and the company's general encouragement of consumption. The Irish government has been slow to collect money from Apple. In fact the Commission is taking the country to court to speed up the process, and could level a fine.